A dramatic and architectural use of mixed metals and geometric forms, this refined and bold sconce juxtaposes organic feminine curves with sleek masculine precision. Its distinctive voice is full of modern sophistication and soul. Available in Bronze and Antique-Burnished Brass with Antique White Shade and Antique Black Shade. A dramatic and architectural use of mixed metals and geometric forms, this refined and bold lamp juxtaposes organic feminine curves with sleek masculine precision. Its distinctive voice is full of modern sophistication and soul. Available in Antique-Burnished Brass with Antique White Shade or Antique Black Shade. 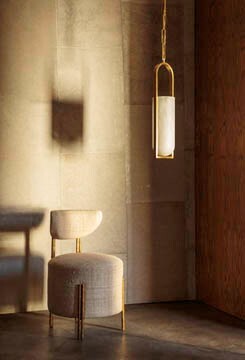 A dramatic and architectural use of mixed metals and geometric forms, this refined and bold lamp juxtaposes organic feminine curves with sleek masculine precision. Its distinctive voice is full of modern sophistication and soul. Available in Bronze and Antique-Burnished Brass with Antique White Shade and Antique Black Shade.